In 2007 I sprained my ankle backpacking in the Sawtooths. In 2008 I sprained my ankle hiking in the Robber’s Roost. The next year I sprained my ankle hiking in The Spur. Ankle injuries were a yearly occurrence. Many people wouldn’t recognize me without the walking boot or ankle wrap. I desperately wanted to find a solution that didn’t involve me quitting the outdoors. 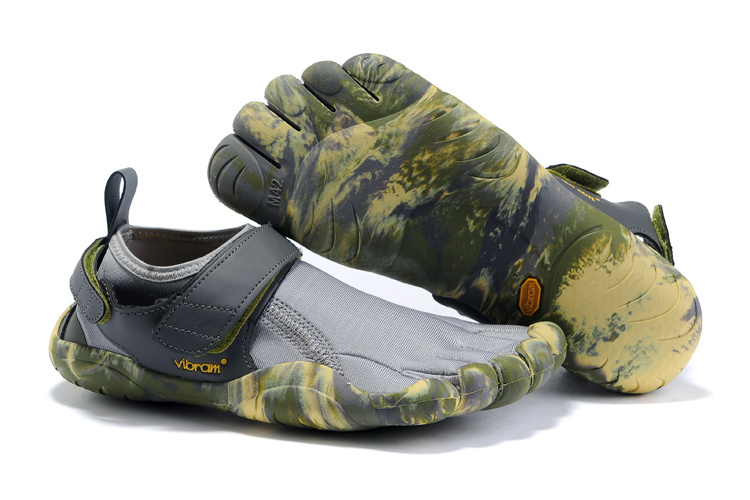 More than 12 years later I am writing a Vibram Five Fingers Review, because I have found that solution. Every year, at the Outdoor Retailer, a slick salesman with the fervour of a Holy Roller, would pitch the latest miracle in footwear. Because I was desperate for an injury free season, I would throw my hands up scream “I believe” and head to the nearest footwear retailer to purchase salvation for my gams. As the summer would pass the walking boot would come out, the doctor bills would pile up, and another pair of high-priced-hiking boots would be put to rest in footwear graveyard. Now 9 years later there are only 5 new graves and my ankles have had four years to heal. My discovery of Five Fingers from Vibram solved my problem. I had been aware of Vibram Five Fingers for many years, I always thought they were strange looking and just the latest fad. I had zero desire to buy a pair, until I signed up to run the tough mudder. A friend of mine put a team together and I decided to give it a try. She suggested I get a pair of Five Fingers, because according to her, they were what worked the best. A class action lawsuit against Vibram had just been filed and most of the stores in my area were trying to dump their inventory so I got a pair for cheap. Normally I wouldn’t have paid the $100 plus price tag. When I first tried putting the five fingers on, I thought I had made another mistake. Getting the toes in the proper holes was frustrating. Eventually I figured out that if you do the two small toes first, everything else just falls in place. I can’t say my toes ever adjusted to the five fingers. However, for my intended use, it wouldn’t matter. My friend suggested I break them in slowly, but I chose to ignore her and jumped into jogging as much as I could. I think I was into the sixth week of training when I had an injury. Most running shoes have a rocker design to propel you forward into your next step. Without this rocker design your calves have to do significantly more work. When I first started running with the Five Fingers, I noticed my calves were more sore. They seemed like they were getting larger and they cramped often. One day while running, my calf muscle tore. I do not know if it was related to the Five Fingers or not. I come to the conclusion that it may have been my error for not getting used to them. There was a lot of strain on my calves that I didn’t experience with other running shoes. I can’t say they caused it, I can’t say they didn’t. If they were the cause, I may have been able to avoid it, by taking it easy to begin with. The real test for the Five Fingers, was if they could survive a backpacking trip. I decided to give them a try on a three day backpacking trip down Death Hollow in the Escalante Grand-Staircase National Monument. Death Hollow was a three day trip that would put the Five Fingers through a lot of use. The trail would consist of walking over slickrock, sand, mud, water, and gravel. During the course of the three days, I never came close to twisting my ankles. For the first time in 7 years I finally felt stability in every single step. There were several times that I would step on a rock and it would hurt a little. This wasn’t really something faulty with the Five Fingers, but the type of Five Fingers I had. As I mentioned before, I got them on discount, and the tread on the bottom would have been better suited for a deck shoe. The other small issue is sand. Sand easily gets inside and rubs your feet raw. This was a bigger annoyance to me than the thin tread on the bottom. I remedied this by getting a pair of neoprene socks and just cutting the toe box out of them. I have been impressed enough with the Five Fingers that I did invest in a second pair for full price after my first pair wore out. The second pair has thicker tread on the bottom. I have not had any problem with rocks pushing on the sole of the foot. Probably the best footwear for people with weak ankles who are accident prone. The offer a great grip on all surfaces and make for an excellent athletic trainer. They wouldn’t be good for colder weather or climates, but they are ideal for backpacking, hiking, and fitness. If you can get used to having something between your toes, these could be the last recreation shoe you buy.